Since the Charlie Hebdo massacre, the scope of state repression has drastically increased. France's far-right is on the rise. While the National Front (FN) did not gain control of any of the regions in the regional elections runoff, it led in the first round with 30 percent of the vote and gained 6.7 million votes, their highest yet. Marine Le Pen naturally crowed at the results, highlighting what she said was the breakdown of the "old political class". The main casualty was the centre-left with the combined vote for the right in the first round was 55 percent. Several factors explain this surge. The financial crisis and its fallout, serial crises in the eurozone, and President Francois Hollande's failure to implement his promised reforms, have been an ongoing propaganda coup for a party purporting to be "anti-system". But just as fascists in a previous era relied on anti-Semitism, so the FN's message is packaged in Islamophobia. And here, the political and media establishment bears primary responsibility for legitimising the FN's obsessions. It was in the early 1980s that the French government began to blame Islam for the nation's social distress. Amid a global recession and with a left-wing government implementing austerity, a strike movement took off in the car industry, in which approximately half of the employees were migrant workers from former French colonies. The Socialist prime minister blamed the religion of the strikers. Soon, popular media such as Le Figaro were asking about French Muslims: "Will we still be French in 30 years?" In 1989 and 1990, a series of schools began to target Muslim girls for wearing the hijab, supposedly a sign of their refusal to integrate - a controversy that gained momentum with the French state's intervention in Algeria's civil war against the Islamists. Later, with the "war on terror" in full swing, President Jacques Chirac proposed a "veil law" banning the wearing of all religious symbols in French schools. In 2011, the state passed a further law banning the right of Muslim women to wear any face-covering in public. The result was to effectively place those Muslim women who prefer the niqab or the burqa under house arrest. Wedded to the French state religion of 'republicanism', [the French left] has failed to even acknowledge anti-Muslim racism. Today, most French people consider Islam to be "incompatible" with French values. 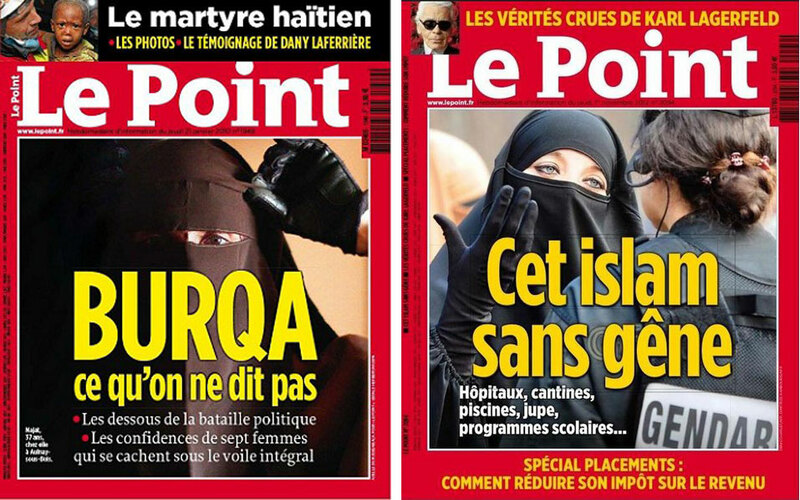 Leading journalists such as Claude Imbert of the respected conservative magazine Le Point, proudly claim to be Islamophobes. A recent cover of the magazine featuring an image of a Muslim women wearing a niqab, bore the headline: "Brazen Islam ... in school cafeterias, hospitals, and swimming pools". The culture war against Muslims is a war with teeth. France is a country where around 70 percent of the prison population is Muslim. It is a country in which there is systematic racist brutality on the part of police. Now, with the emergency laws in place, police are empowered to carry out arrests, raids, house arrests, usually directed against Muslim citizens or businesses, without any judicial oversight or justification. The French government has made it extremely difficult for Muslims to protest. In 2012, when the satirical magazine Charlie Hebdo published a series of Islamophobic cartoons, the government banned planned protests against the publication. Last year, when activists sought to protest against Israeli attacks on Gaza, the government used exaggerated reports of anti-Semitism among Muslim protesters to impose bans. Since the Charlie Hebdo massacre, the scope of state repression has drastically increased. There were widespread calls for the policing of those "who are not Charlie", including from Nathalie Saint-Cricq, chief political editor of France 2, who argued for surveillance of possible malcontents in the schools. A series of arrests were handed down for purported "glorification" of terrorism, including that of an eight-year-old schoolboy. The current three-month "state of emergency" introduced by Hollande extends past practices, and builds on an increasingly racist and authoritarian culture on which the far-right thrives. The left has performed poorly in the face of this offensive. Delegates of the Left Front, aligned with the French Communist Party, even voted in favour of the government's emergency law. This was self-defeating since, aside from French Muslims, the first targets of such repression were the forces of the left. As environmentalists prepared their protests in time for the COP 21 summit, the French police put a number of activists under house arrest, with no justification. However, this is the culmination of the French left's long-standing difficulties in confronting the growing problem of Islamophobia. Wedded to the French state religion of "republicanism", it has failed to even acknowledge anti-Muslim racism. Even Jean-Luc Melenchon, founder of the Left Party, though he has in recent years acknowledged the problem of Islamophobia, supported the veil ban in 2011, and condemned the 2012 candidacy of a hijab-wearing women for the New Anticapitalist Party. This silence left a space in which fools such as Dieudonne M'bala M'bala, the comedian and political activist, could gain some support among French Muslims, but it also empowered the far-right while doing nothing to reverse the balkanisation of French society on racist lines. The Martinican poet and anticolonial activist Aime Cesaire wrote, when fascism last swept the continent, of the colonial roots of this barbarism: Europeans had "tolerated that Nazism before it was inflicted on them […] because, until then, it had been applied only to non-European peoples". For, "before engulfing the whole edifice of Western, Christian civilization in its reddened waters, it oozes, seeps and trickles from every crack."